If you missed the webinar or would like to revisit the information presented, please visit the NCMGMA website at www.ncmgm.org and click on the red “Member Login” button on the home page. Once you are logged in, click on the “Members” menu item at the top of the page, and this will take you to the “Member Center.” Once on the Member Center page, scroll down the page and the PowerPoint presentation (PDF) and MP4 video from the July 17th webinar will be the first items under the “NCMGMA Webinars” header. 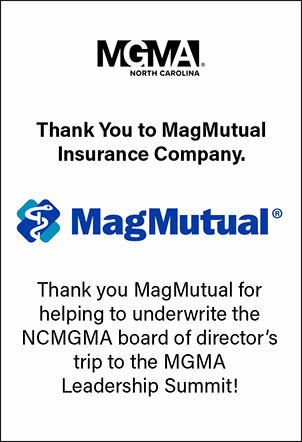 If you have any difficulties accessing the files or logging into the members-only part of the website, please contact the NCMGMA offices at info@ncmgm.org.